The keywords that impact organic search revenues are often as complex as the business itself. Our ability to recognize that each keyword we target requires different tools to identify and different approaches to optimize can mean the difference between a successful SEO campaign and a failed campaign. I saw one company reach #1 for their primary keyword at the very tail end of that keyword’s demand curve because their SEO only looked at the number of searches at one point in time and didn’t think holistically about the trends. The result was a lot of effort, minimal traffic, confusion, and frustration. As you try to visualize annual search volumes for a particular keyword more as one of many possible demand curves rather than a pure number, you’ll gain greater segmentation abilities and better optimization strategies. In many respects, the ideal keyword is one whose search demand is nearly always constant. This is the benchmark that all other keyword demand curves are measured against. A static demand curve allows you to project exactly how much traffic your site is likely to get at any given search ranking (assuming no changes in page header data, which could impact click-through rates). Some industries are fortunate to operate in near-static conditions—fortunate in that an SEO can focus on rankings without being hampered by trends. In fact, niches were this static demand exists tend to be very crowded, because of the predictability—the assurance that work put toward SEO for a particular keyword will help the site inch closer to the ultimate goals of rankings and traffic. Keyword research and selection should be fairly easy. A number of keyword tools exist (the most accessible being Google’s Keyword Tool). Even though the data in these tools can often lag by several months, the static nature of these keywords should be enough to trust the numbers reported in the tools. (As a note, I’ll primarily use ‘exact match’ reported numbers along with ‘Global Search’ as the benchmark setting for evaluating keywords in Google’s tool). With the right numbers in hand, you can adopt a fairly common head/middle/long-tail keyword strategy–selecting groups of similar keywords and assigning them to particular landing pages on your site that you want to rank for those words, optimizing accordingly. Seasonality creates uneven search demand. Holiday keywords, for example, will always see similar increases and decreases at the same time every year. Fortunately, identifying groups of seasonal keywords is generally pretty easy. However, predicting search volumes for seasonal keywords isn’t always easy. Since tools like Google’s Adwords Keyword Tool report volumes on a delayed basis, you may see zero search volume for a keyword that is actually being searched quite heavily. You won’t see those heavy search volumes reported until after the window of opportunity is passed. Let’s assume you decide to start a ski clothing company in June. The usual keyword tools aren’t going to tell you what your best keywords will be since you’re researching during the off-season and numbers will be inaccurate. 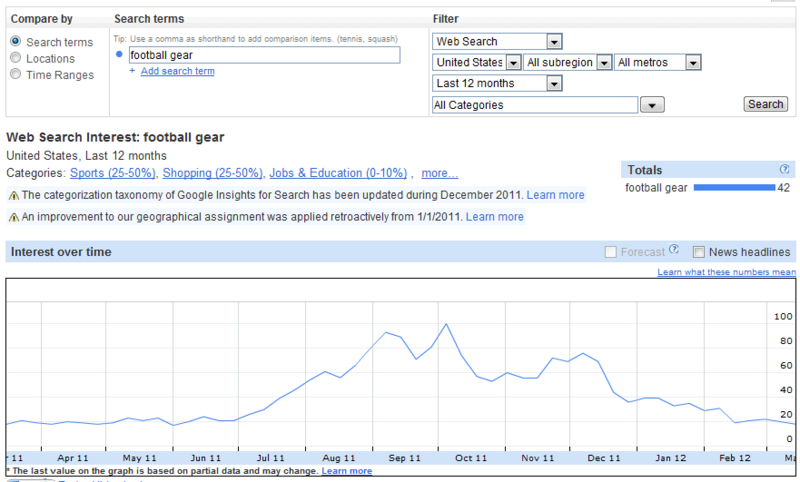 Some paid tools like Keyword Discovery keep a running database of words so that you can look at seasonal numbers. A free way you could approach the problem would be to use Google Insights, which will allow you to anticipate keyword volumes as a multiple of existing traffic, which you could pull from Google’s Keyword Tool. As you can see, keyword volumes can be extrapolated by using the comparative index shown in Insights. You could also just check out your competitor’s site if you know they’ve been doing their own SEO and/or PPC in past years. Don’t assume they know what they’re doing ,but use competitor sites to corroborate your own research. I know of many companies with very seasonal businesses that start picking up SEO work 4-6 months before peak season hits. I consider this a very solid approach. Spiking keywords have a short shelf-life. Sometimes, you have some time to prepare before the search volume peaks because of advance notice, as in the case of a movie premiere or a product launch. Sometimes you use whatever time you have to research for, build, and optimize content–even if it’s only a few days/weeks. Traditional keyword research tools may not show any search volumes for your initial brainstormed list of keywords and that’s okay. I’ll often use a site like Soovle.com to generate keywords. Soovle is based on the auto-suggest results from Google and other search engines. It may not give you actual search volumes, but the suggested terms and phrases are all currently searched and are ordered by demand (for benchmarking). News sites often count on being optimized for spiking, unpredictable keywords as a way of generating traffic. The demand curve for these kinds of keywords can be nearly identical to predictable spiking keywords, but without any advance warning. Most of the time, news has a shelf life of a couple of days to a week, so waiting longer to post optimized content will completely miss the window. News hits and you have minutes-to-hours to get content up before it’s already past its prime. Sometimes Soovle will be fast enough to pick up on today’s news, and sometimes not. In these cases, I find that predictive keyword brainstorming is enough to get by with. One helpful method is to pick out the important nouns in the story and apply the 5 W’s to each of them to determine which questions people are most likely to have about the story, leading them to search. People are searching in longer and more specific phrases than ever before, so optimizing for those exact questions as your post titles will help you be completely optimized and ranking high. In cases like these, it’s also important to make sure your site is being crawled quickly, either through its own authority or through social media promotion once the content has been published. Some of the toughest keywords to deal with contain attributes of multiple demand curves. They may have an element of constant demand which includes peaks of hyperactivity due to market changes or related news. The easiest approach to these keywords it to use a combination of keyword research approaches. I’ll typically use Google’s tool plus Soovle plus predictive keyword research in combination (and PPC if necessary) to gauge performance and relative importance of the keywords I’m interested in. Some startups definitely fall into a category of ambiguity when it comes to keyword volume trends. Anyone seeking to create a blue ocean business is likely to run into some trouble when it comes to SEO. People aren’t searching for your kind of business. Your keywords may not have even been invented yet. And yet you still want to be found. You can think in terms of solutions rather than keywords. What problem does your product or service solve? What need does it meet? What words are people already familiar with that could be associated with your product? I will issue a caution. I have witnessed some of these kinds of startups put a lot of money into SEO only to be disappointed. It often makes more sense to focus on branding, education, and awareness with your marketing dollars instead of putting them into a channel that relies on heavy assumptions with an unknown payoff.